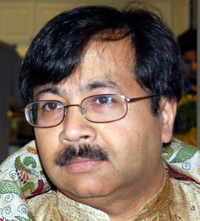 Sudipta Bhawmik is a bilingual playwright who writes his plays in Bengali and English and sometimes both. A semiconductor design engineer by profession, Sudipta has received formal training in theatrical arts in Calcutta, India, under the tutelage of legendary theater workers and playwrights like Sombu Mitra, Tripti Mitra, Saoli Mitra, Mohit Chattopadhyay and others. Sudipta’s Bengali plays have been staged all across USA as well as by professional theater companies of India. Several of his plays have been published in prestigious theater journals in India. His plays has been translated to other Indian languages like Hindi and Marathi. Sudipta is also and actor and director and has staged several plays in and around the New York metropolitan area and New Jersey. He has also performed in Mira Nair’s acclaimed film, “The Namesake” . Set in a suburb of the great city of Calcutta in India during the late seventies and early eighties, The Return deals with the eternal struggle which every immigrant in USA has to go through in order to balance between the strong attachment to their home land and the economic and social demands of life. The play tells the story of a young immigrant man, whose family is dependent on his dollar remittances, decides to go back to his country and faces strong resistance from his loved ones. The Return was produced and staged by the NEAT theater company of Boston, MA. The Bengali version of the play was produced by Ethnomedia of New Jersey. This play is about a person named Subimal who, once an active Maoist communist, had to flee his own country and come to America in search of a new life. Although Subimal did find a new life for himself, his past always haunted him, a past which he had always kept a deep secret. Suddenly, one day this secret starts to reveal itself to his son Somu from a long lost diary. Somu, a Harvard junior, is extremely curious to know the details of his fatherā s past, wants to know more about the Naxalite movement. But he never could have guessed the kind of murky and deep waters he is getting into. Subimal tried to prevent the inevitable, but his failure to do so ultimately leads him to his redemption. The play was staged at the 2005 New York International Fringe Festival. The play is about the continuous fight that each one of us has to go through for our physical and emotional survival, especially for those of us who are the first generation immigrants to USA. The wars we fight are not always just and fair but we still need to fight them anyway. Ron (Ronobir) Mitra, son of a Bengali immigrant family, is a member of the US Army National Guard and is currently deployed in Iraq. Ron ’s parents, Animesh and Shanti, although not happy with Ron’s decision to join the US Army, respected Ron’s wishes to serve his nation. However, Ron’s deployment to active duty in Iraq has been a constant source of tension and anxiety. On the day of the play, at a small get together at Animesh’s place, Surojit Biswas, a writer and journalist from Kolkata challenges Animesh and his guests about their loyalty, their beliefs and their fundamental moral values. The party rapidly goes into a tailspin with each character exposing their secret wars that they have been fighting all along. The Bengali version of the play is currently in production in Calcutta, India by Theater Workshop. Manasij, a veteran Bengali screen actor is visiting USA with a theater group to stage some shows in multiple cities. During his first stop in New York, he is hosted by Dipak and Sharika at their multi-million dollar mansion in upstate New York. The enthusiastic host, Dipak, expresses his desire to make a film with Manasij as the hero and their daughter Pom as the heroine. But Sharika objects to this proposal vehemently. She would never let Pom take part in this dream project of Dipak. Manasij tries to mediate, but soon realizes that he is being pulled into a dark vortex of suspicion and animosity that was carefully camouflaged by the opulence and the veneer of apparent happiness of an affluent Indian American family. A senior Bengali virologist returns to India, after retiring from his medical practice of 35 years, to find peace, tranquility and solace amongst his family and old friends. But soon he discovers that his nemesis has followed him and he has nowhere to hide.